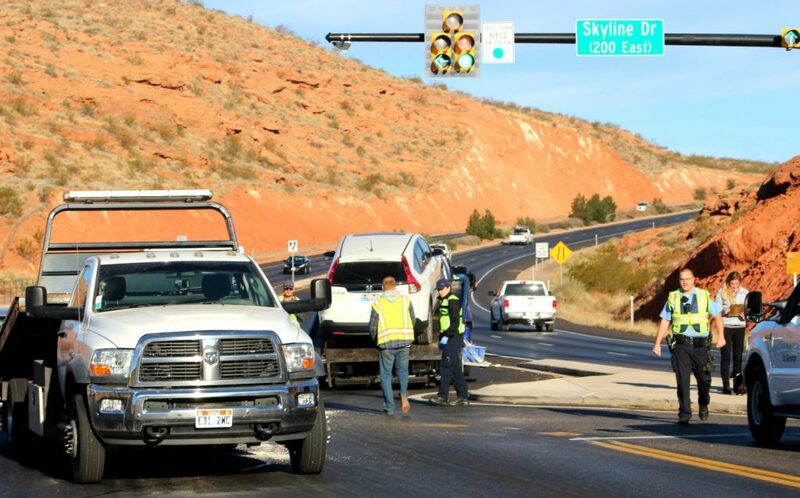 ST. GEORGE — One driver was injured and transported to the hospital after a two-vehicle crash on Red Hills Parkway partially blocked traffic and left two vehicles damaged Friday morning. At 10:15 a.m., officers and emergency responders were dispatched to the intersection of Red Hills Parkway and Skyline Drive for the crash involving a white Honda CR-V and a Toyota passenger car. 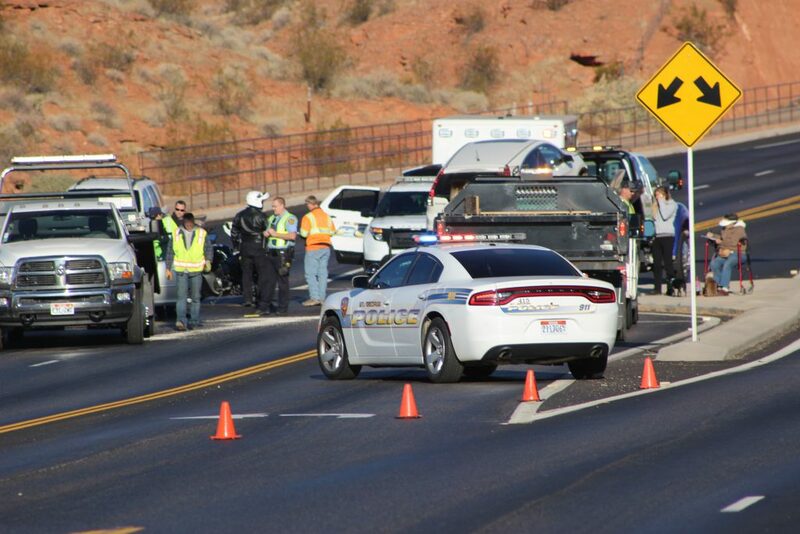 Officers found that the woman driving the Toyota had sustained an injury to her foot during the collision, and she was transported to Dixie Regional Medical Center for treatment, St. George Police Officer Dave McDaniel said. The woman driving the Honda reported she suffered no injuries during the crash, along with her two small dogs that were shaken but otherwise uninjured. 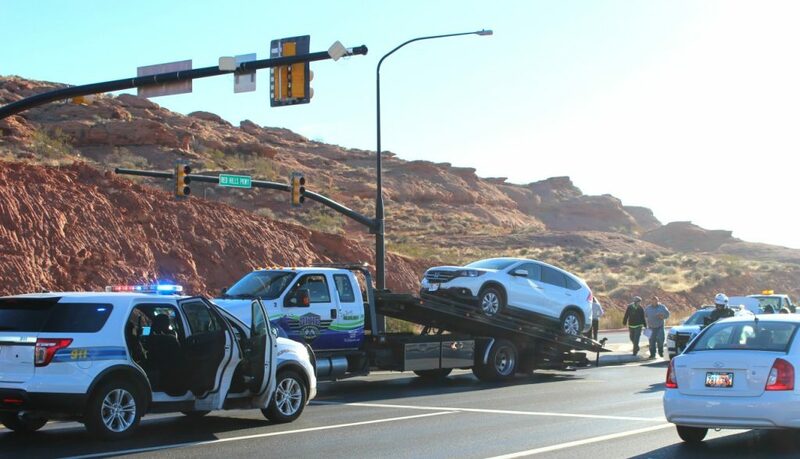 Officers learned during the investigation that the woman driving the Honda was heading westbound on Red Hills Parkway and moved into the left-turn lane to head south on Skyline Drive, while the Toyota was heading east on the same street, the officer said. The Honda pulled forward to make the turn and was struck by the eastbound Toyota before the Honda was able to clear the intersection, which spun both vehicles around, blocking an eastbound lane and triggering the airbags to deploy in the Honda. “Multiple witnesses said the Honda pulled out right in front of traffic,” McDaniel said. 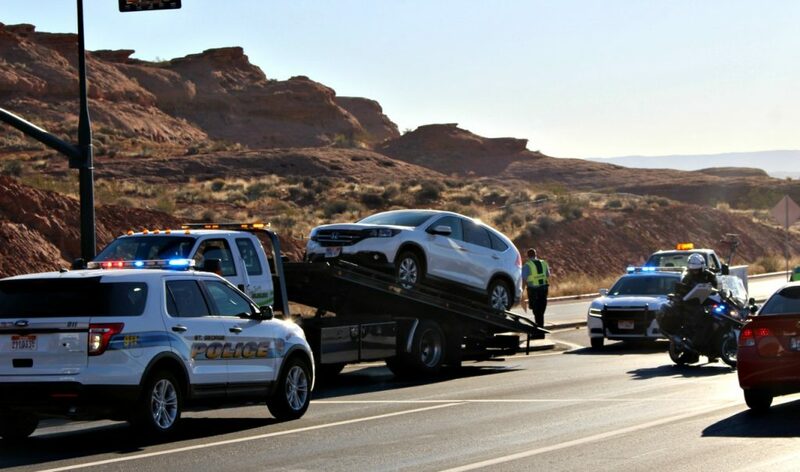 Both vehicles were rendered inoperable and towed from the scene, and both vehicles’ occupants were properly restrained at the time of the crash. The driver of the Honda was issued a citation for failing to yield on a left turn, he said. Traffic was affected for approximately 40 minutes to allow responders to tend to the scene and clear the vehicles from the roadway. This report is based on statements from police or other emergency personnel and may not contain the full scope of findings. The driver of the Honda was cited for Failure to Yield….just wondering how fast the East bound car was traveling? The Speed Limit slows to 40 before the intersection so a typical STG driver was going between 50 and 60! Heaven needs to help you in St. George if you used to drive where a left turn lane with a green light meant it was your turn to go. Distraction is bad enough, without deceptive lights.